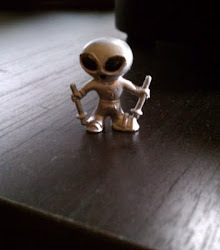 High Strangeness: Who's "The Alien Guy"?? Start 'em early, that's what I say. When it comes to parenting, one of the most important things to remember is to start teaching your little ones about UFOs early and often. I know, because I've raised four kids, and they all know the score where paranormal phenomena are concerned. 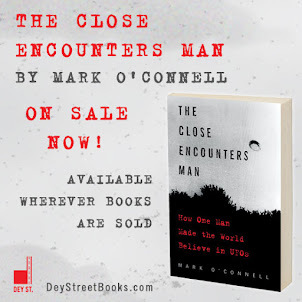 I hadn't fully appreciated the value of this, however, until this past June as I was out promoting The Close Encounters Man at an indie bookstore in Chicago. There was a small group --I believe the euphemism is "intimate" -- there to hear me talk about my book, and among the audience were a dad and his son, who I guessed was 4 or 5. When I was done talking, I signed a copy of the book for them, and thanked them for coming. I was disappointed by the turnout, I admit, but when I mentioned that afterward, my daughter Dxxxxx said, "If it makes you feel any better, you made a convert to the cause tonight. That little boy in the front row was hanging on your every word!" I guess I was so wrapped up in my presentation that I hadn't noticed the boy's interest, but it did make me feel better to know that even a 5 year-old could get into listening to me talk about UFOs and aliens. Fast forward to late August, when I attended a meeting of the screenwriting faculty at DePaul University, where I teach. I said hi to a few of my fellow professors, and then a familiar but unfamiliar professor said hi to me, and mentioned that had been at my book signing event with his son. Talk about a small world! I had a nice talk with my colleague, who I now recognized -- his name is Jef Burnham -- and told him what my daughter had said to me about his little boy after the book signing. 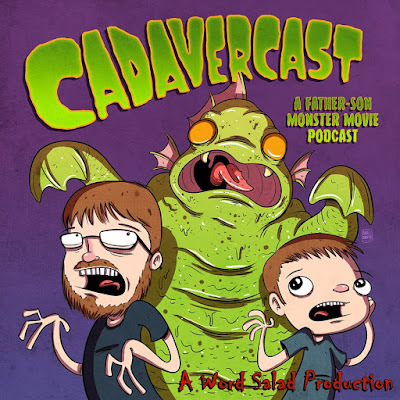 Jef laughed and said that he and his son Alistair host a horror and science fiction movie review podcast called Cadavercast. He explained that his son was excited at my book signing because he realized there was somebody else in the world who loves the same things he and his dad love! So, I hadn't converted the little boy as my daughter had thought; he was already a convert! How cute can you get? And who can't relate to that electric feeling you get when you realize someone else loves science fiction and monsters as much as you do?? Well, since that meeting I've been listening to Cadavercast and loving it! Jef and Al put on a fantastic show, they have great chemistry (as you'd expect), they really know their stuff, and best of all, they make me want to watch all my old sci fi and horror movies again! My favorite bit so far is when they review the 1951 film, The Thing From Another World, and the subject of John Carpenter's terrifying and gory 1982 remake comes up. Five year-old Al keeps talking about the Carpenter remake as though he's watched it several times, but dad Jef keeps correcting him, pointing out to Al that he will not actually be old enough to watch the remake for many, many, many years. It's just a riot listening to dad subtly setting his determined son straight on the matter. And if that wasn't reason enough to listen in, get this: any profit Jef and Al make from the show goes into Al's college fund! I can't recommend Cadavercast strongly enough. I really appreciate it, Mark. Al was positively thrilled to hear "the alien guy" has been listening. He's good kid indeed. One of a select few 5 year olds who can tell you about Bela Lugosi and Karloff I guarantee it! Cute story. Small world indeed. Best line: "An intellectual carrot... mind boggling!"